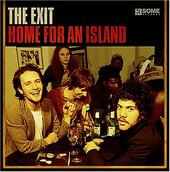 Playing with a punk mentality, and using their punk influences, New York City's The Exit's sophomore album, Home for an Island, also incorporates the band's love of dub and reggae, creating an interesting mix that may seem odd to the unknowing. But, upon your first listen to Home for an Island, you will "get it". From the groove-laden opener of "Don't Push", its rich dub influences very apparent from the sound of the guitar, and its reggae rhythms giving the song its memorable groove, the band adds a rock sensibility to the song. Which helps to transform it from standard dub and reggae into a new sound that is both complex and enlightening. From there, the album continues on with this idea, as "Back to the Rebels" attests to. Danceable and filled with an irresistible groove, The Exit add some rock guitar noise and hooks to the reggae, while "Darlin" finds the band giving the same treatment to a rock ballad. Stepping away from the reggae for a bit, "Soldier" is an acoustic song that shows the band can step aside from their sound and still sound good. Ending on a high note, "Already Gone" closes the album and gives you a taste of the band's more poppy side, still incorporating the reggae, mind you. It's a wonderful voyage, one that is both rocking and danceable. Never overwhelming or awkward, The Exit effortlessly blend their influences and create a sound that, unlike others who say this, is uniquely their own. I'll give it a B.